Crisp mountain air, free flowing rivers, wide open fields. Welcome to Colorado. Colorado is an adventurer’s dream thanks to its scenic landscape and towering mountains. The Centennial State is home to 53 mountains with an elevation of at least 14,000 feet, by far the most in the U.S. From the snow-drenched Rocky Mountains to the deep river canyons, Colorado boasts some of the most beautiful and diverse terrain in all of the U.S. Ready to book your trip? Check out our handy guide to the best RV camping spots in Colorado. Kick back, relax and enjoy these stunning Colorado campgrounds. 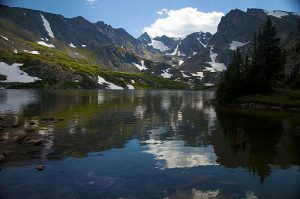 Rocky Mountain National Park is the crown jewel of the southwestern U.S. It’s home to 415 square miles of awe inspiring scenery, from the endless aspen forests to the massive Longs Peak summit. This northern Colorado campground is also super RV friendly. Campers can post up at the Timber Creek Campgrounds, located on the west side of the park. The 98 spot campground is located right on the Colorado River and next to the beautiful town of Grand Lake. 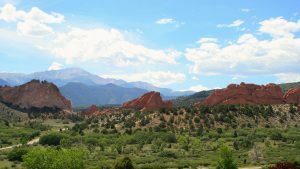 There’s no shortage of attractions in Colorado Springs. Located on the eastern side of the Rocky Mountains, this popular spot is also the largest city by area in Colorado. Really, though, the main attraction is Pike’s Peak. This snow-drenched 14,000-foot mountain is home to some truly unforgettable hikes. You can park your RV at the nearby Mountaindale Cabins & RV Resort. It has full hookups and is only 15-20 minutes removed from Colorado Springs. This beautiful campsite is home to wandering wildlife and plenty of room for exploring. Looking to camp near Denver? Check out Golden Gate Canyon State Park. This nearby getaway is located only 30 miles west of Denver. Surrounded by 12,000 acres of forest, this campground is a great place to bike, hike or adventure. 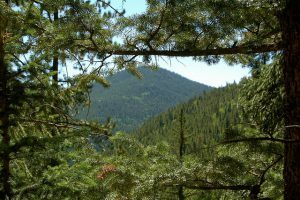 Golden Gate Canyon State Park has over 150 campsites to go with 35 miles of unforgettable hiking trails. You can alternate between camping and city life at this convenient campground. Yes, that Yogi Bear. Yogi Bear Jellystone Park is a family friendly campground named after everyone’s favorite anthropomorphic bear. Located near Estes Park, this park is loaded with features like full hook ups, a heated pool, mini golf, a game room, and convenience store. Of course, the real treat is the scenery. It’s set at the base of gorgeous cliffs and green fields. 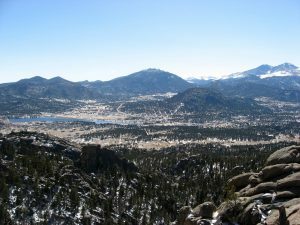 A short drive to Estes Park promises wildlife sightings, world-class hikes, and challenging rock climbs. With the seemingly infinite mountain ranges in Colorado, it’s easy for some to get lost in the shuffle. Case in point: The Sangre de Cristo Mountains. The southernmost subrange of the Rocky Mountains, these gorgeous mountains extend from southern Colorado into New Mexico. 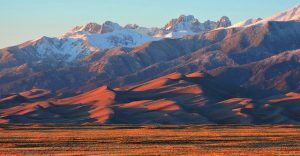 The red, barren mountains are in stark contrast to the snow-drenched mountains of northern Colorado. Your best bet to see these beauties is to book a stay at the Grape Creek RV park. They have panoramic views of the mountains to go with full hookups, a laundry room, and a fire pit. 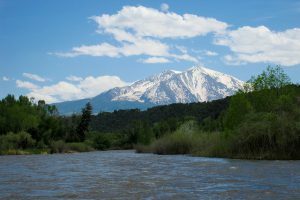 Pagosa Springs has a little something for everyone: hiking through the San Juan Mountains, fishing in the San Juan River, skiing at Wolf Creek. This popular southwestern Colorado city is also home to two national forests, waterfalls, and natural hot springs. You can set up camp at Sportman’s Campground, located in the heart of the San Juan Mountains. They have full hook ups and are mere minutes from unforgettable hiking, biking and rafting locales. Aspen is such a popular winter tourist destination that it’s practically become synonymous with great skiing. But you might not know that it’s a fun place to visit no matter the time of year. By summer time, the snow drenched town attracts everyone from mountain bikers to zipliners to hikers. RV campers can post up at the Aspen-Basalt Campground in the neighboring town of Basalt. This full hookup site is next to trout hotspots like the Fryingpan River and The Roaring Fork River. They don’t call Kremmling a “Sportsman’s Paradise” for nothing. This quintessential camping spot offers the best Colorado has to offer from breathtaking backdrops to the flowing rapids of the Colorado River. Located along Byers and Gore Canyon, Kremmling’s dramatic and expansive terrain looks like something out of an old western movie. You can enjoy Kremmling camping at Red Mountain RV Park. They offer full hookups, boat rentals, and plenty of nearby fishing. You’re probably familiar with the Twin Cities. But what about the Twin Lakes? This epic camping spot sits right next to Colorado’s two largest glacial lakes and the base of Mount Elbert, the highest point in the state of Colorado. The spectacular mountain and its panoramic views are like something out of a dream. RVers can set up camp at Parry Peak Campground. This Forest Service Campground may not have any hookups, but it more than makes up to it with its privacy and stunning views. The picture says it all. 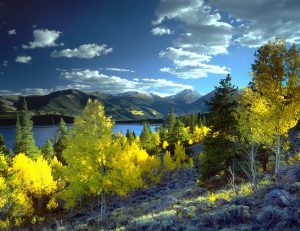 The Arapaho & Roosevelt National Forest looks a creation by the legendary Bob Ross. 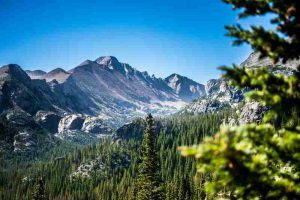 Located in north central Colorado, it’s home to 1.5 million acres of sprawling wilderness and awe-inspiring scenery. The Canyonside Campground is the best spot to camp before exploring this legendary forest. It has 10 RV sites and is located along the Cache La Poudre River, which offers legendary river rafting, kayaking and fly fishing.